Tattoos are everywhere. Almost 45 million Americans have at least one, and 1 in 5 want those tattoos removed. Rodgers Center for Plastic Surgery is proud to introduce Boise to an unparalleled breakthrough in laser technology — the Cutera Enlighten™ III laser tattoo removal system. Is that you staring at the same tattoo that serves as a reminder of something you’d rather forget? 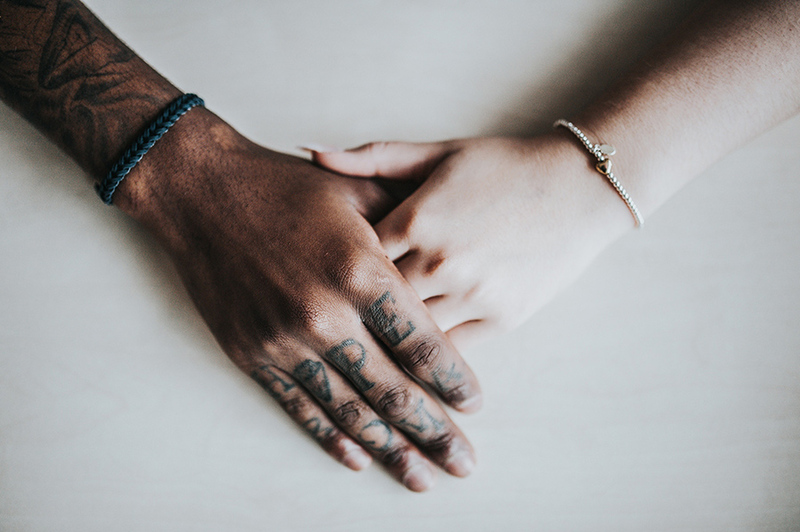 If that’s you wearing the armband to cover up your ink at work, if that’s you getting tired of the lower back tattoo commentary, Rodgers Center for Plastic Surgery offers non-surgical alternatives. Let’s get rid of all tattoo regret and erase unwanted tattoos to revitalize your skin. Cutera Enlighten III represents the pinnacle of laser tattoo removal technology. It’s the most advanced laser treatment available for safe and effective tattoo removal. Cutera describes its Enlighten system as “The most advanced laser system for tattoo removal and skin revitalization.” Cutting edge technology like Enlighten™ gives us the unique ability to reduce or eliminate a wide range of tattoos and benign pigmented lesions. It’s an ideal blend of technologies – correct wavelengths, precise pulse durations, and exact energy levels, all working to remove unwanted ink! Try this innovative, non-thermal way to get rid of unwanted tattoos and revitalize the skin. Ink comes in a diverse range of colors from all over the spectrum. Tiny particle sizes found in tattoos make a formidable challenge for any tattoo removal specialist. These ink particles come in countless sizes, colors, and formulations. The Enlighten™ III utilizes multiple wavelengths that target specific colors at multiple treatment depths with adjustable pulse durations. That means we can address ink particles of any density and size. Our de-inking process is fast, safe, and effective. We’ll remove your tattoo effectively so you can move on with your life. We can remove the really difficult types of ink clusters, like blue and green, even previously treated tattoos! The Enlighten III means fewer treatments and improved recovery time. We can achieve faster results at a higher quality than thermal treatments. Some of us get a tattoo spur of the moment. That used to mean living with the choice for the rest of your life. But you live in the lucky times of laser tattoo removal. Yes, even previously treated tattoos that failed to clear can now be removed by Dr Rodgers. Dark blue, green, and other stubborn ink spots will vanish in only a few treatments. Schedule an appointment today to see how Dr Rodgers with new PicoSure laser technology laser can remove your unwanted Tattoo. A. 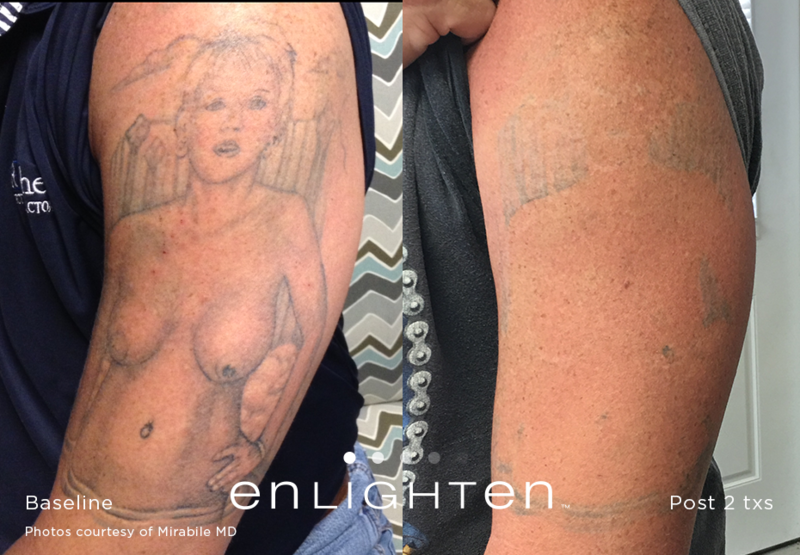 The number of treatments depends on the size, ink color and depth of the tattoo, but since the Enlighten III utilizes multiple wavelengths at targeted pulse durations, this means fewer sessions will be required. Q. Why is the price per session more expensive than other places? A. Cutera Enlighten™ III has an advantage over other tattoo removal procedures: fewer treatments necessary for removal (about a 1 to 3 ratio). That means the total cost will end up being less because your tattoo will be removed sooner. Q. Does Cutera Enlighten III work on permanent makeup? A. Unfortunately this current model cannot be used on permanent make-up. Q. Does the Enlighten™ treatment hurt? A. Treatment can feel somewhat akin to getting a tattoo. Patients often tell us that it feels like a rubber band snapping against the skin. Some patients may experience skin redness, bruising, or a crusting effect after being treated. These symptoms will quickly subside within about 1 week. If symptoms persist, please contact us immediately; we’re committed to giving our patients concentrated aftercare. Q. How long do I wait between treatments? A. Laser tattoo removal treatments should be broken up into 6-8 week intervals. Your skin has to go through the process of breaking up ink pigments into smaller pieces and absorbing them through the body’s natural functions. Your body needs time to do its healing work. Enlighten™ III is so precise that ink pigments get broken up into smaller pieces than other lasers on the market. This enables your body to remove ink more effectively. Q. Is the Enlighten™ laser FDA approved? A. Yes, Enlighten™ received its FDA clearance back in August of 2014. Enlighten was the first and only dual wavelength (532 nm/1064 nm), dual pulse duration picosecond laser tattoo removal and skin repair system cleared for sale in the US. Treatment is not only safe, but effective for the right individuals. Q. I have had my tattoo treated with other tattoo removal lasers, but can’t seem to make further progress. Will Enlighten™ work better? 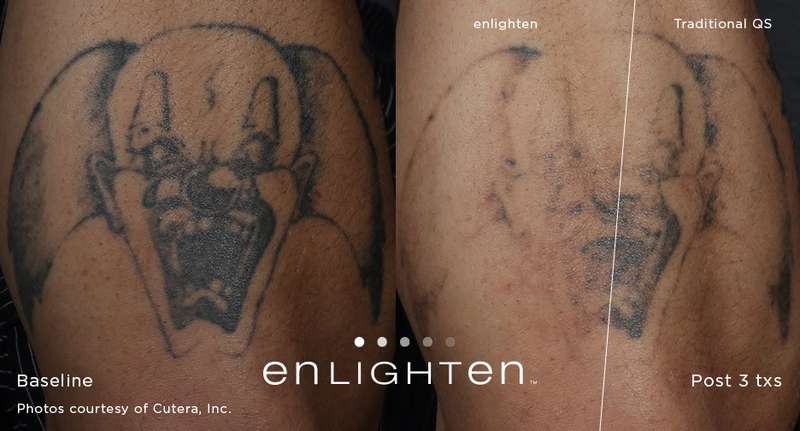 A. Enlighten™ is the newest technology in laser tattoo removal. It’s so effective that it can remove a wide spectrum of ink pigments. It can even be used on tattoos previously treated by other tattoo removal lasers, usually with great success. Q. What is the aftercare like? A. During laser treatment, your tattoo may turn white briefly. It then swells somewhat and may turn red, but this usually lasts only a few hours. It is important to keep the tattoo covered with ointment and a bandage for the first day. Usually, it feels like a mild sunburn and does not hurt unless rubbed against. We’ll give you the concentrated aftercare you need to enjoy optimum, lasting results. Between treatments, be sure to keep your tattoo covered from the sun to prevent hyperpigmentation (darkening). We’ll tell you everything you need to know during your initial consultation. Call Rodgers Center for Plastic Surgery to schedule your appointment today!